What are the CPS-2 Roll-Up Packs? The Roll-Up Pack List is a documentation roms that can be placed on an SD card for a complete CPS2 kit setup that's ready to use. They include every single CPS-2 game and hack. This will save people from having to scour the forums to find everything. I'll update my lists whenever new content is available. The current pack is for users with the latest firmware, who have wired their kit to support key writing. This allows it to flash MAME ROMSs, with accuracy so perfect that Twin Galaxies is now accepting submissions on the kit. The "Old" set is for old firmware users and is no longer updated. The most common kit problem is SD card incompatibility. Test multiple cards before reporting problems, especially if they are larger than 4GB. Format only as described above. Format the SD card every time you update your pack, before copying new files to it. This prevents corruption and alphabetizes the game list. Format and re-copy everything, every time. "No SD Card Detected" probably means you didn't create a \games folder. It can also mean that your microSD isn't compatible or needs to be formatted correctly. Should only be used to pull ROMs into your base pack, unless you want to scroll through hundreds of duplicates on the LCD selector. 2018-04-26: BASE: Fixed Progear: Halfway to Hell. Thanks @PascalP! 2017-11-19: New Packs launched for the new firmware. A huge thanks to @Darksoft and Company for the key-writing functionality. 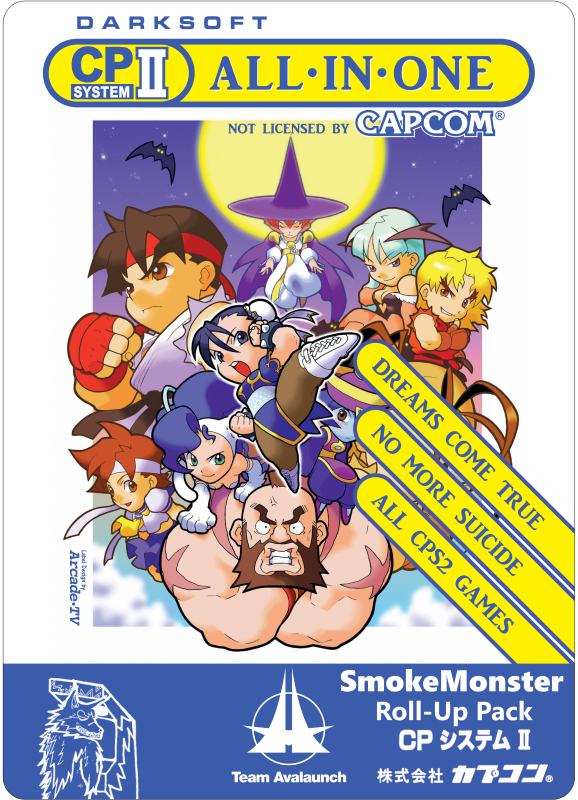 A major thanks to @rtw for the MAME CPS2 scripts!! And a big thank you to @ekorz for providing his perfect MAME base pack, upon which this entire set was built, and for making the new NAME files and Game List!! 2017-11-18: OLD Packs FINAL release. This will not receive updates. The post was edited 47 times, last by SmokeMonster ( Apr 26th 2018, 7:22pm ). Folder link unavailable so sayeth Mega. Can't access it. Get ToS'd that quickly? Or copy wrong link somehow? I think that the url was just wrong. Working now? Awesome job! Now where do I download that label? The post was edited 1 time, last by fruityloops ( May 27th 2016, 4:35am ). Here's V1 (above) and V2. Mitsurugi-w sells nice die-cut prints of them too. Hey are the names.txt in the pack? Yes, it has the fixed MegaMan/Rockman 2. Cooooooooooooooooooooooooooooooooooooooool. Literally just copied the files over the my SD card :). Awesome job as always Smoke! Your rom packs are the best! Does it have the bit-swapped Eco Fighters ROM or just Ultimate Ecology ?